We were able to have some in-depth conversation around workplace violence issues and discussed several security improvements for offsite care areas and employee parking. We look forward to more innovative proactive measures to help ensure patient and staff safety. We have reached a few tentative agreements but face big proposed takeaways in Extended Illness Benefits (EIB), requirements for per diem nurses and changes in education hours and funding for nurses. We have exchanged staffing proposals and are encouraged by the movement in this area. We want to let the nurses of St. Joseph know that we are working hard for a fair contract which addresses all the items of concern that have been expressed. Questions? Contact WSNA Nurse Representative Sue Dunlap at sdunlap@wsna.org. We held negotiation sessions two and three late last week with management. Both WSNA and management have now submitted their opening bargaining proposals. We are starting far apart on a host of issues, including takeaways including management’s latest attempt to eliminate Extended Illness benefits (EIB). As always, we will have a fight ahead to secure a fair and equitable contract. Management is engaging us on key issues including contract language to prevent workplace violence by patients and visitors. Stay tuned for more information and direction on how you can help your negotiations team here at the table. Thank you all for your hard work every day caring for the community. As always, reach out to any one of us or your local unit rep for questions, comments or concerns. We met with management for our first day of negotiations on Thursday, Feb. 21. We worked hard and were able to present a comprehensive proposal to management which addresses the key areas of concern and generated some great discussion. Management has not presented their proposal as yet but has indicated they will do this at the next session. Thank you to everyone who filled out the survey and attended the kick-off. If you have any questions, please feel free to reach out to any one of us. What's going on in our local unit? Our unit reps did it – they stood up for the rights of all union nurses and won! Last spring, the local unit reps at St. Joe’s began wearing and distributing the blue WSNA badge buddies that read “Washington State Nurses Association RN,” and also have our representation rights printed on the back. They were instantly a big hit. The number of nurses wearing the badge buddies grew fast and could be seen throughout the hospital. At the same time, we noticed an increase in the number of nurses invoking their representation rights requesting union representation when they were called into a meeting with management. Unfortunately, PeaceHealth administration was not so fond of the WSNA badge buddies. Management told nurses they were not allowed to wear them and to take them off. WSNA tried to resolve the matter informally with management but was not successful in that effort. 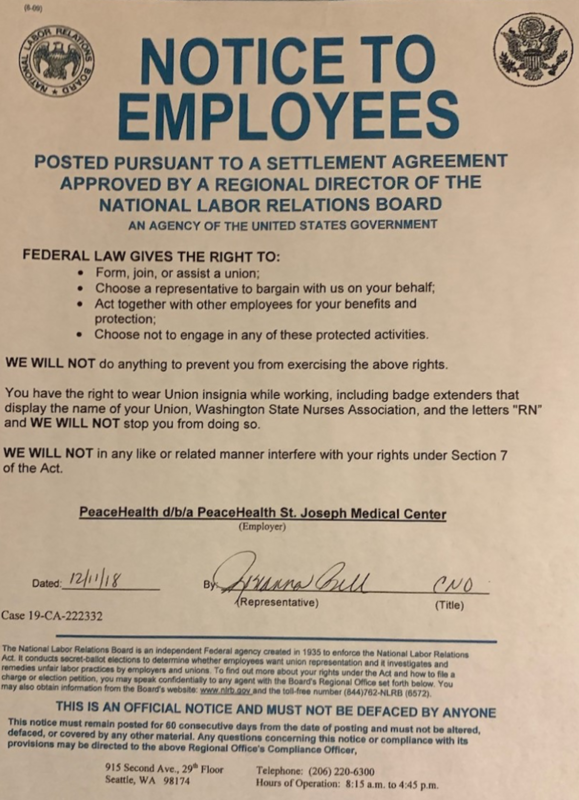 Consequently, WSNA filed an Unfair Labor Practice (ULP) with the National Labor Relations Board (NLRB) for PeaceHealth violating the rights provided to union workers under the National Labor Relations Act (NLRA). WE WILL NOT do anything to prevent you from exercising the above rights. You have the right to wear Union insignia while working, including badge extenders that display the name of your Union, Washington State Nurses Association, and the letters "RN," and WE WILL NOT stop you from doing so. WE WILL NOT in any like or related manner interfere with your rights under Section 7 of the Act. The St. Joe’s unit reps’ actions are a magnificent example of solidarity and standing up for union rights! We now have a new supply of beautiful newly designed WSNA badge buddies. Every nurse should be wearing one to show we are proud union nurses and also so we all have the representation rights ready for anyone who may need them. If you do not have a badge buddy and would like one, contact any local unit rep, local unit officer or Nurse Rep Sue Dunlap (SDunlap@wsna.org). Hello everyone, this February we start the negotiations for our contract which expires March 31, 2019. We had an excellent response from our bargaining unit on the survey. Over 80% of our nurses took the time to fill out the survey to let us know what is important to them. We want to give credit to the unit reps who reminded nurses to fill out the survey. The unit reps have made a huge difference in our nurses being engaged and participating in union activities. This year we used a new method to remind everyone of the kickoff party for negotiations that was on Feb. 11. We used a method called the Hustle text, whereby nurses received the reminder via text. It was a huge success – everyone looks at their texts! We have used the RoboCall in the past but our response to the Hustle text was phenomenal. Our survey showed that nurses are concerned about what nurses have been concerned about for years. Safe patient care has always been at the top of the list of concerns. We encourage nurses to continue to fill out the staffing concern forms when you have concerns about your assignment. The staffing concern forms for the new 2nd surgical made a difference. Nurses took the time to write down their concerns about assignments on 2nd surgical and the lack of a dedicated NTL for that unit. As a result, 2nd surgical now has a dedicated NTL and an overlap nurse. WSNA reviews the staffing concern forms with management in the staffing committee as well as in the bi-monthly conference committee meetings. WSNA also makes sure your manager's response is sent to you. Remember you don't have to ask permission from anyone to write a SCF. This is not a reflection on management but rather a method by which you are documenting an assignment concern that affects you and/or your co-workers. Negotiations in the past have taken as little as 2 months and as long as 11 months. Three years ago, we received a contract from management that had over 30 takeaways for the RNS. Your WSNA nursing board spent 10 months fighting the takeaways. Remember the negotiations are open to the nurses. It is an educational experience and you get to see your board, nurse rep and WSNA lawyer in action. The dates for March are March 1, 21 and 26. The negotiations will be at HEC Room C. We have the room from 8 a.m.-5 p.m. but will post more specific times as we get them. As soon as we know all the details, we will let the bargaining unit know via signs on the WSNA bulletin boards in your unit and hustle text. After negotiations, the nurses will vote on the contract and at the vote, we will be asking you to sign up for a spot on the WSNA board for a three-year commitment. There will be several positions to choose from: co-chair, co-secretary, co-communications officer, co-grievance officer, treasurer, safety officer, and co-membership officer. We have over 850 union nurses at St. Joe’s, we need a full board consisting of 13 nurses. No experience is necessary. Several of the nurses on the board are either going to retire or step down after this term. Their dedication to supporting nurses is without question but we need new nurses to now step up and take their place. Please consider running for the WSNA board. If you have specific questions about any of the positions, you can call or write to anyone on the board. Our phone numbers and emails are on the WSNA roster, which is on your WSNA bulletin board in your unit. Do my complaints/concerns get heard? This is a question we hear often from the nurses. If you have a complaint or concern about your work or working conditions, WSNA encourages you to speak to your manager first. If you feel your concerns were dismissed or went unheard, please contact anyone on the WSNA board. We will do our best to resolve it. Recently, the ED nurses contacted us and told us there was a "new policy" whereby nurses were not being allowed to put in for PTO days on their days off so they would be insured they would get a block of time off. WNSA contacted the director of the ED and we received an email from HR stating this was a miscommunication and that nurses were to put in for their scheduled days off, thereby ensuring they would get a block of time off. Some issues are not so easily resolved, and we have had to file a grievance. WSNA always tries to resolve issues with management through collaborative conversation first. WSNA has heard complaints from nurses that they are being told they can't change shifts for 18 months. If this has happened to you, please contact someone on the board. Again, our contact information is on the WSNA bulletin boards and on the WSNA website. WSNA has also heard from nurses regarding their frustration with getting PTO. WSNA has had many discussions with the employer concerning this issue. We want all nurses to know we hear you loud and clear and we know what a huge dissatisfier this is for nurses. Article 7.8 Weekends: Nurses accepting training positions in the Childbirth Center were being made to work every weekend. This practice had been going on since 2014! WSNA tried to resolve this issue in meetings with management. When that was unsuccessful, WSNA filed a grievance. WSNA prevailed in this grievance that we presented to the Chief Nursing Office. As a result, all the nurses who were working every weekend in the Childbirth Center were able to get a new schedule that gave them every other weekend off. If a nurse wants to work every weekend he/she was allowed to stay on that schedule. Article 7.11 Per Diem Nurses: After years of encouraging per diem nurses to sign up for extra shifts, the hospital started refusing per diems nurses extra shifts. This was a complete switch in their approach to per diems working above their required 4 shifts a month. WSNA tried to reach an understanding with the employer concerning this issue in our bi-monthly meetings. When that failed, we filed an association grievance. WSNA prevailed in that grievance and per diems should be getting all their shifts put on the schedule by the 20th of the month. If you are a per diem and you are being refused shifts, please let WSNA know and we will follow up. Pay: Recently, two nurses filed grievances because the hospital refused to pay them their justly earned wages. One nurse was on Rest Less than 10 and another nurse had not been paid her Certification premium for almost a year. WSNA filed a grievance for both nurses and the hospital paid both of them their back wages. All monies owed the employee are due in full on a designated payday. This is not only contractual but federal and state law. If you have been refused wages that you have earned, please notify Sarah Newell or any of the other WSNA board members. WSNA has zero tolerance for nurses not receiving their wages. The federal and state law put the ownership on the employer to pay the employee correctly. We don't want any nurse to feel intimidated to ask for their correct wages. We will do it for you. Like always, we encourage you to talk to your manager first. If that is not immediately successful, please notify WSNA. The federal and state law state the employer has to pay back wages up to 3 years. So even if your wage in question is not current, please talk to us. We want to make sure every RN is paid correctly. Education reimbursement: WSNA has heard from many nurses their frustration with the education reimbursement system that is at PeaceHealth. The system to get your education reimbursement has recently changed, but nurses are telling us in mass that the new system is just as clunky and not user-friendly as the last system. WSNA has had many discussions with the employer about this and that this is a huge dissatisfier for the nurses. If you need help with navigating this new reimbursement system, go to your manager. He or she should be willing to help you with the process. WSNA is going to continue to have discussions with the employer about this reimbursement system that clearly is a deterrent to nurses to get their education monies. Holiday guidelines: The Mutually Established Guidelines for Scheduling Paid Time Off is referenced in Article 9.4. These guidelines were recently revised through a collaborative effort with the employer. The new guidelines have new dates for when the holiday schedule will be out. The holiday week from Christmas Eve to New Year’s should be posted on your unit by July 1. Once this week is posted, it cannot be changed except by mutual consent. We have also included the sentence "every effort will be made to not schedule staff for both Christmas Eve and Christmas." Please read the revised holiday guidelines under Crossroads. Go to Nonclinical and Staffing. New law concerning sick days: MOU #1 outlines the rules around unscheduled absences. The new law concerning unscheduled absence states the employer cannot count unscheduled absences against you as long as you have PTO on the books. This new state law supersedes the contract. The employer has acknowledged they will follow the new law. On call: Article 8.5 calls out the units that have mandatory call. If your NTL has told you that you have to be on call, and you are not working in one of the mandatory call units, let WSNA know. Recently, we had a collaborative discussion with management concerning ICU nurses being told they have to take call. This is a violation of Article 8.5. The employer can ask you if you would like to be on call, but they can't mandate it except in the units described in Article 8.5. The employer agreed to educate the NTLs in ICU about not mandating nurses to be on call. Mandatory education: the employer has in the last year required nurses to have lots of mandatory continuing education. If you are a FTE nurse, you do not have to work above your FTE. Period. To require you to work above your FTE is a violation of the contract. If you do not want to work above your FTE, speak to your manager. If you feel your concerns were dismissed or went unheard, please let WSNA know. HR has recently communicated with WSNA that they acknowledge no FTE nurse has to work above their FTE. Mandatory education may put you in premium or contractual OT. If you feel you may qualify for PTO, let your manager know. Once again you can always contact your WSNA officers for questions. Washington State Nurses Association union nurses have rights. Representation rights! To understand your representation rights, you also need to know what an investigatory interview is. An investigatory interview is when you are questioned by your manager or director about any issue that you are involved with that could possibly lead to disciplinary action. This can include tardiness, overtime, patient complaints, peer complaints, etc. You should ask at the beginning of the meeting, “Is this a meeting that can lead to disciplinary action?” If they answer “Yes” then you have the right to ask for representation. If they say “No” and indicate that you don’t need anyone, listen carefully to what is being discussed. If it starts to feel like it could lead to discipline, you have the right to invoke your Weingarten rights. The employee must make a clear request for union representation before or during the interview. The employee cannot be punished for making this request. (Note: Do not ask the employer, “do I need union representation?” It is up to you to make the statement that you want union representation.) Remember, management is not an appropriate representative, so if they offer you the nursing supervisor or someone else to sit with you, that is not adequate. Give the employee a choice of: 1) having the interview without representation, or 2) ending the interview. If the employer denies the request for union representation and continues to ask questions, this is an unfair labor practice and the employee has the right to refuse to answer. The employee cannot be disciplined for a refusal to answer questions without union representation. If this discussion could in any way lead to my being disciplined or terminated, I respectfully request that my union representative be present at this meeting. Without representation present, I choose not to participate in this discussion. Did you know it is your federal right to contact your union concerning your work or working conditions? You do not have to contact your manager first if you have questions about your work. You cannot be reprimanded or told not to talk to the union or union officers. This is a violation of federal law. WSNA officers are here for you and if you have concerns or questions you can contact one of us or WSNA Nurse Rep, Sue Dunlap. Just a quick note to introduce myself to all of you. I am so excited to be working with all of you and so thrilled to be with a unit that is so organized and cohesive. This is a testament to each one of you as members as well as the guidance and leadership of your local unit officers. I have been a nurse for 35 years and have had the most incredible career spanning almost every area of specialty across Canada and the United States. I recently completed my master’s in nursing education but my passion at this juncture in my life is to pave the way and make things easier and better for the nurses coming behind me. I have worked in leadership roles in the past including management and previous director of a Home Care agency. In my previous employment, I served as local unit chair, grievance officer, local unit rep, conference committee chair and co-chair of the staffing committee. While I openly admit to a learning curve, as every facility’s history and contract language is slightly different, I welcome input and advice and am excited to continue the growth here at St. Joseph’s Bellingham. I have a unique relationship with St. Joseph’s Bellingham as I worked in the PACU, the ED and Life flight here many years ago. I was also a patient here as my daughter was born at this facility. There are faces and names I still recognize – many dear friends from days gone past. Being here feels like coming home! Thank you to all for the warm welcome and a special thank you to Barb Friesen who has graciously agreed to be available and provide insight and advice during this transition of nurse reps. Please feel free to contact me with any questions! Join your negotiations team on Monday, Feb. 11 in Conference room 5 and 6, drop-in style, beginning at 1:30 p.m.! Have your voice heard and stand together with your team for the best contract. There are various ways for everyone to be involved. Be a part of positive changes at PeaceHealth St. Joseph’s! Questions? Contact WSNA Nurse Representative Sue Dunlap at sdunlap@wnsa.org. Beginning Monday, Dec. 17, 2018, Sue will be taking over all new issues as they arise at PeaceHealth St. Joseph Medical Center. I will be assisting Sue with this transition in the coming months as needed. Sue can be reached at SDunlap@wsna.org or at 206-575-7979, ext. 3005. It has been a pleasure working with you over the past nine years. I am continuing my work here at WSNA as a nurse representative with new assignments. I will miss you all but know you will be in good hands with Sue. It's almost time for contract negotiations again! Our current contract between WSNA and PHSJMC expires March 31, 2019. The pre-negotiation survey is the first step in our preparation for contract negotiations. The information we get from the survey is data we use in determining our priorities as we head to the bargaining table. For that reason, it is crucial that we know every nurse’s issues and concerns prior to the start of the negotiations. Our power comes from the willingness of registered nurses to stand together; our strength is in unity! Remember, in order for WSNA to be an effective, strong and influential voice at the negotiation table, we need every member involved and working together. Take the survey now, and make sure every nurse at PHSJMC you know and work with to takes it too. Sarah Newell-Chair, Geri Falacy-Secretary, Michelle Leidal-Treasurer, Rhonda Tull-Grievance Officer, Laura Bayes-Membership, Arlene Copps-Membership and Tracy Pullar-Safety Officer. Questions? Contact WSNA Nurse Rep Barbara Friesen at bfriesen@wsna.org or at 206-575-7979 ext. 3056. Thank you for your dedication, courage and commitment! Please drop by and join us in celebrating all you do! WSNA is inviting all nurses to come celebrate all that you do! When: Monday, May 7 from 1 - 5 p.m. There will be tasty treats, friends and drawings for prizes for all WSNA members. Show up and get an extra entry into the drawing! Safe Staffing Committee nurse nominations needed! The current members of the Safe Staffing Committee met on March 13, and determined every unit should have a staffing committee member plus an alternate representing them on the committee. Also, the length of the monthly meeting should be increased to 8-hours, at least until the staffing plans on every unit meet the requirements of the recent changes in the Safe Staffing Law. We have received several nominations. However the units listed below still need nurses nominated. This is an opportunity for you to have an impact regarding staffing on your unit. Nobody knows more about your unit than you. This work is important and your time is paid. Please nominate yourself and/or other nurses you believe would represent your unit well. The deadline for nominations is March 30, 2018. Stay in the know with your local unit! The PeaceHealth St. Joseph Medical Center/WSNA Local Unit Board sends out a newsletter at least twice a year. We hope the newsletters are informative and get you interested in your union. The nurses on the board would like to get some important messages out to the nurses we represent. Unfortunately there has been some individual bargaining with nurses by management at PeaceHealth. If you are a per diem nurse, your obligation is to give your availability for four shifts a month. There has been at least one incident where the management told a per diem nurse she had to do more than four shifts a month and that she had to do evening and nights. The nurse not knowing this was individual bargaining and was a violation of the contract, as well as federal law, verbally agreed with the demand she work as management said. Another nurse was told to sign a "contract" concerning her working conditions. This also is individual bargaining and illegal. Article 1.1 of the Collective Bargaining Agreement states "The Employer recognizes the Association as the sole and exclusive bargaining agent for this Agreement shall cover, all registered nurses employed by the Employer as Staff Nurse, NTL and Per Diem Nurse." If management tells you to sign a "contract" or that your obligation is more than what is in the contract or anything you think may be individual bargaining, it is important to get ahold of one of the nurses on the board, or your nurse rep. Our contact information is on the WSNA bulletin board in your unit. If you are applying for a new position within the hospital, read the job posting carefully. If there are REQUIRED job skills in the job posting, be sure you put on your application how and why you meet the REQUIRED skill sets. If the recruiter doesn't see where you have addressed the "REQUIRED" skill sets, your application will be deemed "NOT qualified." If the job posting states certain skill sets are "PREFERRED" and you have those preferred skill sets, be sure to put this in your application as well. PeaceHealth now has over 800 nurses. There are eight nurses on the WSNA Board. We are trying our hardest to be there for every nurse, but we need more nurses on the Board. We have a few positions open; co-chair, secretary, communication and grievance officer positions. We ideally like to have two nurses in every position except treasurer and safety officer. There are four nurses on the Board who will be retiring in the next few years. This could potentially leave the Board with only four nurses trying to represent over 800 nurses. If you are interested in knowing more, please contact one of the nurses on the Board. For any position you are interested in, we will mentor you and support you every step of the way. The nurses on the Board in the past and present have worked very hard to get us a fair contract and many of the benefits you enjoy because of the contract could go away if we don't have a strong board and engaged nurses. Many of the things we now have in the contract, such as premium pay and EIB could be in jeopardy in future contracts, unless we have engaged nurses who value what a unionized workplace brings. Remember the union is not the nurses on the board or the WSNA Seattle office. The union is you, all 800+ nurses at St. Joes! Print out and fill out the WSNA reimbursement request form (found in Crossroads, Learning and Development). Take the completed WSNA reimbursement request form, certificate of completion, receipt (or proof of payment) and program brochure/learning objectives to a copy/Xerox machine that has the ability to "scan and send" (the "scan and send" function is next to the "copy" function on the touchscreen of the copy/Xerox machine). Place all of your forms in the tray of the copy/Xerox machine. Press the "scan and send" button on the touchscreen. Enter your PeaceHealth 3x3 when prompted for who you are sending it to. Choose yourself/your PeaceHealth email address when the copy machine locates you by using your 3x3. Press the Start/Go button. It will take your forms through the feeder, scan them and email them to you as an attachment. Take your forms with you and go to a computer. Go to a computer and log in. Open your email. Open the email from scanner@peacehealth.org. Click "download" under the attachment (the paperclip symbol). At the bottom of the screen it will ask "Do you want to open or save [file] from outlook.office365.com?" Click the downward arrow to the right of "save" and then click "save as." "File name" is highlighted—name the file what you want and then click "Downloads" on the left-hand side of that window. Open Crossroads, System departments, Finance and accounting. Then click "Accounts payable" on the left. Under "Forms" click "Caregiver expense reimbursement." Sign in with your 3x3. Electronically fill out the form. All boxes in red must be filled out. Under "Company" type 800. Under "Accounting unit" type 8008671. Under "Account" type 73020. You must also fill out a few boxes that aren't in red: "Date" (in the first column: the date you did the education), "Registration, tuition" (in the first column: this is the amount you are requesting and are sending receipts for). When the form is completed, click "Click to add attachments-Max 10MB." This is 3/4 of the way down the form. A new window will open. Click "Downloads" on the left side of the window. Then double click the file name that you saved earlier (from step 8). This will electronically attach all of the forms that the Xerox/copy machine sent you. You know it attaches when a paperclip symbol appears to the right of the "Click to add attachments-Max 10MB." Write down the "Invoice #" on the bottom right corner of the form. This is your record that you filled out this form (although you should print out a copy of this in step 15, below). The final step: Click "Submit" near the bottom of the form. If it successfully submits, a new screen appears that states, "Form submitted successfully. Your invoice number is xxxxxxxxx. Please print a copy of this page for your records. Once you click ok, you cannot access this form." Click "print" and save this paper for your records. I attended the WSNA Leadership Conference in Chelan, Washington on Sept. 22-24. The theme was Surviving and Thriving in the workplace. Some of the topics covered included current issues in the news: Right to Work legislation, Freedom Foundation, Patient Safety Act and the impact of Social Media in the workplace. The conference is always very informative and fun. It's good to spend time with other WSNA members from around the state and learn how things go in their hospitals. I am always so impressed with how committed these nurses are to making sure nurses are treated fairly and within their perspective Collective Bargaining Agreements. What I have learned is that our nurses at St. Joe's have one of the best, most inclusive and progressive contracts in the state. That is due, in part, to our Chair, Sarah Newell, who has worked tirelessly on the Board for the St. Joe's nurses for over 20 years. She cares deeply for nurses and makes certain we are all treated fairly by management. We are really hoping that some more of you nurses will get involved and want to be a part of making sure our nurses continue to negotiate a fair and equal contract. Please think about it, your input into our future is important and we would love to have you on the Board. Do you know how to do a policy search? First: Define whether you are looking for a protocol (such as the Heparin drip protocol), a procedure (such as discontinuing a central line) or a policy (such as instituting restraints). 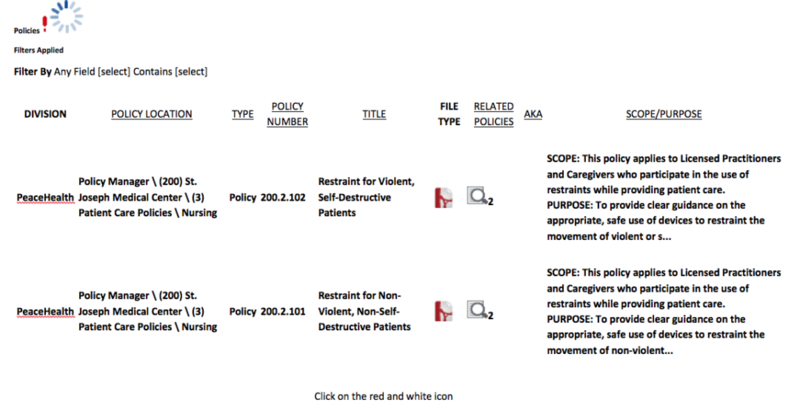 Protocol: In EPIC: Open patient's chart > Under the Summary tab click on “Plan of Care.” In the middle of the screen there will be protocol orders. Go to the protocol order you are interested in and click on the blue writing after References (i.e. Reference: Heparin Protocol). Protocol will pop up! Procedure: Go to library (Crossroads > My tools >Library). Under Nursing Clinical Information choose Clinical Skills. Type in what you are hoping to find. For example, you will not find anything under "discontinuing central line," but if you type in "Central line" many items will appear, and one of them will be "Central Venous Catheter: Removal". Title and AKA Searches. Click inside "Enter Value" below and add search word(s). Earlier this fall we had a gathering of unit reps, both new and long-time, for a dinner meeting. We had great attendance and it was good to see so many enthusiastic members. During the meeting we discussed what issues each unit was working on and sharing thoughts on how we can best assist our members. The unit reps are going to be your contact point on the floor, they can help answer questions and assist you with next moves if necessary. Your unit rep is there for you and understands the unique needs of your unit. We spent time defining the role of the unit rep as well as brainstorming ways to further strengthen and educate nurses so they feel empowered to get help when an issue arises. We have unit reps on almost each unit and we would like to have one rep per shift from every unit, so don’t feel like you missed out, we are happy to have new unit reps join! Meet and greet new RNs on the unit. Orient them to the contract and education reimbursement. Take turns participating in cafeteria time every first Tuesday of the month. Writing articles that interest you for the WSNA newsletters. Be the first to learn what is happening around the hospital. Option to learn the grievance process and how to represent colleagues at meetings with management. Help develop a strong, effective and meaningful unit rep network. Unit rep meetings every three months the second Tuesday of the month at 6 p.m. Next meeting is April 10. If you are interested in becoming a unit rep please contact one of the local unit officers, unit reps or Nurse Rep Barbara Friesen at bfriesen@wsna.org. WSNA reviews the Staffing Concern Forms with management at our monthly meeting. 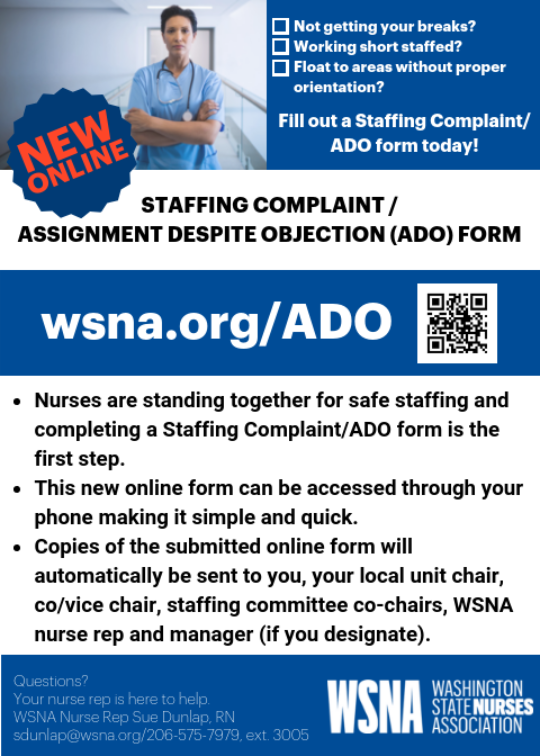 Please continue to document your staffing concerns on this form, as this is an important way you have to document what occurred on your shift. Your manager should be discussing with you what occurred to gather information and understanding so we all can take better care of our patients. If at any time you are told you have to ask "permission" to fill out a SCF or you feel chastised for filling out a SCF, let one of the board members know. WSNA has discussed with management that this tool is not a reflection of management, but rather documentation of what occurred on a shift. The SCF can be found on Crossroads, Nonclinical on the left hand side and then go under Staffing. The following are situations that have occurred to St Joseph’s Medical Center nurses. If these situations happen to you, please contact a WSNA officer. Have you requested an education day off from work to complete online continuing education and received a response from staffing office denying the day off because “online continuing education can be done on your days off”? WSNA and management agreed that nurses can take a day(s) off from work to complete online education. The process is: the nurse requests the education day off and states what education will be completed (“online education”), the staffing office will allow that date to be taken off if staffing allows and if that date cannot be accommodated then another date within a pay period will be offered by staffing office to the nurse. Proof of CE’s from that date, in the amount of the hours the nurse took off from work, must be turned in to their manager in order to receive education leave pay. Have you contacted your staffing office or your manager to take time off due to the death of an immediate family member and were given a personal day(s) rather than bereavement time? To clarify, personal days are either deducted from a nurse’s PTO bank or are unpaid. Article 12.8 gives nurses (not on probation) up to 36 hours of paid bereavement leave for the death of a grandparent, parent, spouse, spousal equivalent, brother, sister, child, grandchild or the step or in-law equivalent of parent, brother, sister or child. Have you requested PTO over two weeks in length and received a response from the staffing office stating that PTO in excess of two weeks must be approved by the manager? This process is in violation of our contract which has no maximum length of PTO which can be taken as long as the nurse has, or will have at the time the PTO begins, enough hours in their PTO bank to cover that length of time off. Have you received your final schedule on the 20th of the month, including your on-call schedule (for departments that take call), and are then told any time after the 20th of the month that you must now take additional call shifts? Article 7.11 states that the final schedule will be posted by the 20th of the month, and any changes to the schedule after the 20th of the month, including the call schedule, must be made by mutual consent. Are you a per diem nurse that turned in your next month’s availability which included being available two weekends in a row and were then scheduled for the two weekends in a row, but were not paid consecutive weekend pay? Article 7.8 states that “…in the event a nurse is required to work either Saturday or Sunday on two (2) consecutive weekends, all time worked on the second weekend shall be paid for at the rate of one and one-half (1½) times the nurse’s regular hourly rate of pay…” This pay rate applies to both per diems and FTE nurses. WSNA and PeaceHealth recently negotiated a tentative agreement regarding job posting. The previous agreement required the employer to post all positions for 5 days before permanently filling any position, with the understanding positions will be posted on Thursdays. The new agreement requires the employer to post all positions for 7 full-days before permanently filling any position, with the understanding positions may be posted any day Monday – Friday. We recommend if you are interested in a position apply for it so you do not miss the timeline. You can always withdraw your application if you change your mind. Your feedback made a difference! Thank you to every one of you who took the time to take the Staffing Matrix Change Survey. The data you provided was instrumental in our ability to resolve our staffing grievances with management. They have agreed to return to the previous matrices that allowed for the overlap nurse and did state it would take a couple of weeks to make the change since a couple of the overlap nurses had made changes in their positions but they did hear you, responded and are making the changes you called for. We also reached agreement to look at the Staffing Committee, how many members should be on the committee, from what areas and terms of service. Once that is determined WSNA will seek nominations and hold elections for bargaining unit members to vote on who they would like to represent them on the committee. The goal is to have a Staffing Committee that meets the requirements of the new legislation, is transparent and helps get staffing that produces job satisfaction and subsequently patient safety/satisfaction. Thanks for taking action standing together for patient safety and nurse satisfaction!